Monk's set at the 1959 Newport Jazz Festival is among his greatest moments. 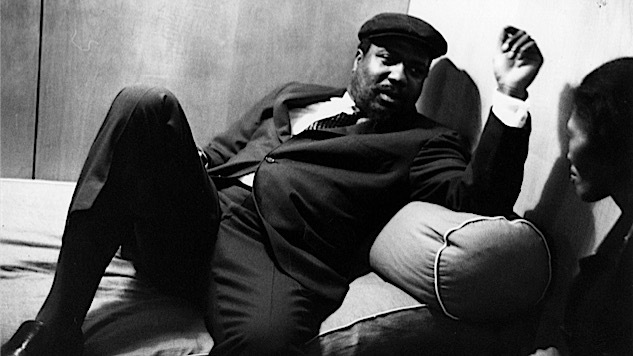 Today marks the centennial of the birth of pianist Thelonious Monk (1917-82), one of the most idiosyncratic stylists and influential composers in the annals of jazz. His staggering output includes several tunes that are regarded as foundations for the music that followed—”’Round Midnight,” “Blue Monk,” “Straight No Chaser,” “Epistrophy,” “Pannonica” and “Bemsha Swing,” to name just a few. With his inimitable improvisational skills and distinctive hats and sunglasses, Monk still cuts one of the most imposing figures in jazz, even 35 years after his death. Despite writing only about 70 pieces of music in his lifetime, he remains one of the genre’s most recorded composers. Born on Oct. 10, 1917, in Rocky Mount, N.C., Monk grew up on West 63rd Street in New York City—the spot where Lincoln Center for the Performing Arts now resides. He started playing piano when he was around 5, and later became inspired by the Harlem stride pianists James P. Johnson, Willie “The Lion” Smith and Lucky Roberts, as well as by more harmonically advanced pianists Duke Ellington and Teddy Wilson. He made his recording debut as a leader in 1947, and quickly became one of the most important artists in the world. To celebrate Monk’s 100th birthday, we’ve dug into the Paste Vault, which includes the archives of the Newport Jazz and Folk festivals, and emerged with his breathtaking performance at the 1959 Newport Jazz Festival. Monk appeared at George Wein’s festival a dozen times over the years before dropping off the jazz scene in the mid 1970s and entering into seclusion. For this show, Monk was accompanied by his longtime tenor saxophonist, Charlie Rouse, and the rarely recorded rhythm tandem of bassist Sam Jones and drummer Art Taylor. Together, the trio swung sympathetically and brilliantly on Monk staples like “In Walked Bud” and “Well You Needn’t,” along with a rousing “Rhythm-a-ning” and an uncommonly sensitive “Crepuscule with Nellie.” This stellar performance came just four months after Monk’s celebrated Town Hall concert in New York, which featured ambitious tentet renditions of his music arranged by Hall Overton. Monk opened his Newport set with a swinging rendition of “In Walked Bud,” a piece based on the chord progression of Irving Berlin’s “Blue Skies,” which Monk dedicated to his friend and fellow jazz pianist, Bud Powell. Rouse stretches out heroically on his tenor solo here, blowing soulfully phrased, robust tones with unbridled conviction for several choruses while drummer Taylor spurs him on with his slickly interactive, boppish swing. “Crepuscule with Nellie,” a gorgeous melody Monk wrote for his wife in 1957, opens with some stirring unaccompanied piano before the full band enters for a patient, expressive treatment of this brief but beautiful number. “Well You Needn’t,” an off-kilter piece that marries dissonance and swing, is given a hip treatment, courtesy of Taylor’s inimitable syncopation on the kit. Monk’s piano solo here is particularly unpredictable and arresting. The set closes on an energetic note with another of Monk’s signature pieces, “Rhythm-a-ning,” a typically quirky number based on the chord changes to George Gershwin’s 1930 composition “I Got Rhythm.” Monk’s demonstrative comping adds an edge to the proceedings, while his solo is strictly subversive. Rouse takes his time and blows effortlessly over the changes on his graceful solo and Taylor imbues the track with a supreme sense of swing on the kit, culminating a most exhilarating set by a true jazz legend.